Our plane arrives around 15pm at Keflavik International Airport. We are lucky, just when we are in the arrival hall our luggage appears on the transport belt. We attach the shoulders straps back on our duffel bags because we have to walk about 700 meters towards the car rental. It seems to be very busy at the car rental. But about 10 minutes later we got our 4×4 car. A Nissan Patrol Arctic, it’s really big if you are used to driving a Ford Focus. 😀 Now we can go to a supermarket to buy some food for a few days. We are driving to the highlands today, so once we are there, there are almost no shops anymore. We stop at the first supermarket that we pass, the Bonus. We know it already from our previous trips in Iceland. Once we have bought our groceries and gas for our stove, we can start our ride to Háifoss and Grannifoss. For about an hour we are following the main ring road ‘1’. Once we have passed the bigger town Selfoss, we can almost leave the ring road, to follow the road ’30’ until we reach the intersection with the road ’32’. A few kilometres later on the ’32’ we take a break to refuel our car. The lady at the gas station is super friendly, we bought an extra fuel can just in case. Just before we want to drive away, she knocks on our window, if we want a bag of white bread and croissants. Because otherwise, she needs to throw it away. 🙂 From now one we are following this road until we leave it to drive on the road ‘332’ towards Háifoss and Grannifoss. After a while, we got a fantastic view on the valley Thjorsardalur. We take a short break to enjoy the stunning view. From now one it’s a short ride until we take the road ‘332’. Just before sunset, we arrive at the canyon. It’s a small hike to the many viewpoints on the waterfalls and the canyon. Háifoss is the second tallest waterfall in Iceland, at 122 meters. It’s getting dark when we are walking back to the car. So we decide to camp somewhere in the area. We find a place right under the power lines, not ideal but there is a place to park our car without damaging the flora. Because we are camping in the wild, we are using the Leave No Trace principles. Tomorrow we are heading to Landmannalaugar. When we get up, it’s still quite foggy. We follow the same way back till we are back on the road 26. Now we are heading to Landmannalaugar. 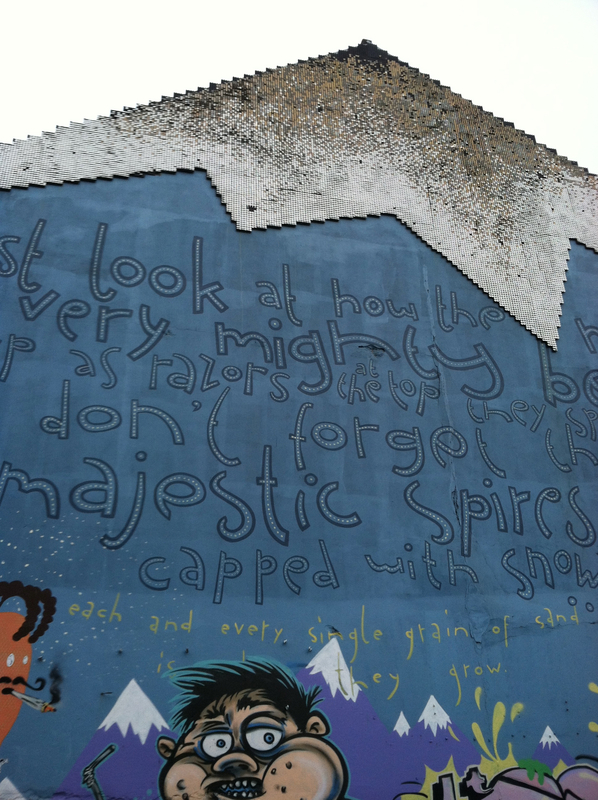 But first, we stop at a hidden treasure. The Tungnaárgljúfur canyon is situated between the river Tungnaá and the lake Hrauneyjalón. Just before the bridge over the Tungnaá river, there is a track on the right side of the road. We follow it for a few hundred meters, and then we need to leave the car behind. We are alone at the canyon, not so strange because there are not so many tourists that known this place. We follow the edge of the canyon for a while. The colour of the river is heavenly blue. 🙂 And the rock formations are outstanding! The contrast with the fluorescent green moss is stunning! It’s strange that there are no waterfalls, the pictures that we saw had a lot of smaller waterfalls. We thought we were at the Sigöldugljúfur canyon but we were at the Tungnaárgljúfur canyon. We found the Sigöldugljúfur canyon on our photographer map, so we did some research and we found this website about the Sigöldugljúfur canyon. But still, we drove to the wrong location. Next time I will use the GPS coordinates to find the canyon. But the Tungnaárgljúfur canyon was also a very beautiful place to visit. Now we are heading to Landmannalaugar. But first we want to visit the explosion crater Ljótipollur, we visited this crater during our previous trip to Iceland a few years ago. First, we follow the road 26, and then we take the F208 towards Landmannalaugar. About an hour later we turn off in the direction of Ljótipollur. There is a clearly visible track to the crater rim of the lake. Now we got a different view on the lake. Last time we walked to the crater and we were staying on the right of the panorama photo. Strangely enough, Ljotipollur’s name means ‘Ugly Puddle’, but the crater is being beautifully red with the lake at its bottom and high edges on its sides. Now it’s a short drive to the lake Frostastaðavatn, we take here a short break to take some photos before we are heading to Landmannalaugar. Just before we arrive at the campsite we have to ford two rivers, but they are easy peasy! We find a place to camp close to the car. We set up our tents and then we go for a hike to the Suðurnamur. The route is marked and you can ask for more information at the kiosk. On top of the Suðurnamur, we got a great view on Jöklgílskvísl, Barmur, Skalli, Bláhnúkur, Námskvísl and the lava field Laugahraun. When we are back in the valley, we got a beautiful view on the Suðurnamur and the mountain Háalda. The valley itself is also very beautiful with dozens of cotton flowers. We walk back to the campsite via a path through the enormous lava field Laugahraun. Today we are heading to Skógafoss, but first, we take a detour to Langisjór. It’s a lake around 20 km in length and up to 2 km wide. There’s a mountain called Sveinstindur. The view from on top of this mountain is outstanding when there is a clear sky. We follow the road F208, soon we stop two times to look at two lakes, they got the same name Kýlingavatn. There is a beautiful reflection on the second lake and there are also dozens of cotton flowers. Shortly after the break, we have to cross the first river of today. Soon we take a second break, we got a view on the valley Illikambur and the mountains Illihnúkur and Hábarmur. The contrast between mountains and the moss are gorgeous Now there are coming several river crossings but most of them are easy. Just before we drive into the road F235, we take a break to enjoy the view on the mountain Hörðubreið and the area around Tindafjall. Almost immediately we stop at the mountain Skuggafjöll, the colour of the moss is beautiful! Now we drive straight to the lake Langisjór, so we got time enough to hike towards the top of Sveinstindur. When we arrive at the lake we cook our meal before we hike to the top of the Sveinstindur. The walk to the top of Sveinstindur is clearly visible and marked with wooden sticks. We took the same way up and down. The hike is about 5 km long in total, with an elevation gain of 425 meters. The first part is easy, then the ridge is starting to get smaller with steep drops and loose rocks. Sometimes it’s a bit tricky especially for people with a fear of heights. But after a climb of 70 minutes, we get a big reward once we are on top of the Sveinstindur. The view is outstanding! The weather isn’t perfect but we got a really wide view on many lakes, mountains and glaciers and of course, now we can see how big lake Langisjór really is. 🙂 About ten minutes later we start our way back to the car. Because of the weather, there is more wind coming and it’s starting to rain quite heavily. About 25 minutes later we are back at the car. Now we are heading to Eldjá. Now it’s the same way back till we are back on the F208. Pretty soon we stop at a viewpoint on the valley Hellnafjall. Afterwards, we drive straight to Eldgjá. Once we are back on the F208 it’s not so far till we arrive at the valley Eldgjá. From the visitor centre, we walk to the waterfall Ófærufoss. The valley has beautiful rock formations at both sides of the Ófæra river. In the early nineties, there was a natural bridge which arched across the lower waterfall, but it collapsed by itself during a flood in the river. Yesterday it was too rainy to photograph the waterfall with an ND filter, today the weather is much better, and I’m lucky there are almost no people. The waterfall is beautiful in its simplicity. Here you can start a hike towards Þórsmörk via the Fimmvörðuháls pass, there are many waterfalls along this trail. We did this hike a few years ago. When we are done, we are heading towards Seljalandsfoss. We are expecting a lot of tourists at our next stop. On our way to the abandoned Douglas Super DC-3, we stop at a viewpoint towards the Þorvaldseyri farm with behind it the volcano Eyjafjallajokull, which erupted in 2010. Sean Stiegemeier made this beautiful time-lapse about the eruption. Since 2011 there is a visitor centre across the road. We tried to find the abandoned Douglas Super DC-3 during our first trip in Iceland, but we couldn’t find it. Now it’s a popular place for photographers. The plane crashed on the black beach of Sólheimasandur in 1973. Because it ran out of fuel but everyone in the plane survived the crash. They removed the most expensive parts but the remains are still on the beach. Now we are heading to Dyrhólaey. When we arrive in Dyrhólaey, we notice that the chance that we see some puffins will be small. After a few minutes, we see some puffins in the air. But it’s not possible to photograph, but luckily we saw them. Normally they are already gone at this time of the year. But the view from here is also magnificent. The black beach within the Vík cliffs and the beach with the Eyjafjallajokull in the distance. Now we are driving to Vík, we need to buy some food for the next days because we are heading to the highlands without any shops. But before we drive towards the inner land we make a short beach walk. Now we are heading to Fjaðrárgljúfur, but first, we stop at two places. Once at Laufskálavarða is a lava ridge, surrounded by stone cairns. All travellers crossing the desert of Mýrdalssandur for the first time were supposed to pile stones to make a cairn, which would bring them good fortune on the journey. Our second stop is at the lava field Eldhraun, this vast lava field is created by the eruption of Lakagígar in 1783. It erupted for a period of 8 months and it was one of the biggest and deadliest eruptions in historical times. The Eldhraun lava field covers an area of 565 km². Now we are almost at the canyon Fjaðrárgljúfur. Once we arrive at the canyon, we go out for a short walk along the eastern edge. And afterwards, we walk into the canyon. The canyon is about 2 km long, with the Fjaðrá river flowing through it. At some points, it is up to 100 meters deep. From now on we let the ring road behind us, and we follow the road F206 towards Blágil. We have to cross a few rivers on our way to Blágil. The second one is the Geirlandsá river, we have to cross it. Before we can enjoy the view of the magnificent waterfall Fagrifoss. Soon we are at the 3rd river that we have to cross. It’s a little bit deeper than the two before. Once we have crossed the river, we are almost at the hut/camping. The campsite is situated in the lava field. There are also two huts. One looks brand-new, the other one is older. There is also a German couple on the campsite, they got their own Land Rover Defender with them. Today we are going to barbeque. 🙂 The aurora forecast is good for tonight a 5 on a scale of 9. But there are a lot of clouds. But I decide to sleep in the car and wake up a few times. At around 3 am, the sky is almost clear. But there are no northern lights visible with the bare eye. With a long exposure photo, it is possible to make invisible on camera. Now I’m going to sleep, I need my rest for the next day. It will be a long day. We got some company when we get up. Three sheep are walking around our car and one of our neighbours. After a while, we notice that the sheep are eating the trash of the Germans. They are still asleep so we put it in a bag and hang it a little higher than before. Not such a good step, because now they want to eat our duffel bags. 😀 When the car is loaded, we are heading to Lakí. It’s about 30 minutes towards the parking near the mountain Lakí. When we arrive at the car park, the ranger from last night at Blágil welcomes us. She gives us some information about the different hikes in the area. We want to climb the mountain Lakí. The ranger advice us to make the small detour through one of the craters. The tracks are both marked, in total the hike is about four kilometres long. The path through the crater is beautiful, the climb to the top of Lakí is simple, nothing compared with the hike to the top Sveinstindur. On top of the mountain, the view on Lakí’s volcanic fissure is amazing! It looks so unreal. It’s starting to rain just when I’m finished with my photos. We walk back to the car and then we drive about 10 minutes towards the crater lake Tjarnargigur. We take the short hike, this one goes only to the crater lake. Now we follow the road F207 counter clockwise until we are back on the road F206. On our way, we have to cross one extra river. Once we are back on the F206, we have to follow the same way back till we are back on the road 206. From here we drive to Kirkjubæjarklaustur, to refuel the car and buy some groceries. The view along the ring road is fantastic. The Vatnajökull looks amazing, that’s why we stop a view times to makes so panorama shots. Just before we arrive in Skaftafell, we take a break at the destroyed bridge in Skeiðarársandur. Now it’s only a few minutes before we arrive at the visitor centre of Skaftafell. Here we got just enough time to do the hike to Svartivoss. It’s about seven kilometres long but the terrain is very easy to walk on. About a half hour later we are already at the waterfall. We are almost alone, so we are lucky. No photobombing this time. 🙂 When we are back at the car, we got a beautiful sunset. We don’t want to camp on the large camping of Skaftafell. So we drive to Svínafell. Today we follow the ring road further towards the east. Our first big stop will be Jökulsárlón. But before that, we take a short break at the smaller glacial lagoon Fjallsárlón close to Jökulsárlón. The first time when we were in Iceland, there was almost nobody over here. Now the parking lot is quite big, and they do boat trips on the lagoon. Jökulsárlón is the largest glacial lagoon in Iceland. The lagoon branches from the Breiðamerkurjökull, an outlet glacier of the Vatnajökull glacier ice cap, the largest glacier in Europe. This is one of the most popular tourist destinations in South Iceland. The lagoon itself is about 18 km2, The size of the lagoon increases year by year as the glacier continues melting. the lagoon is about 200 meters deep, making it the second deepest lake in Iceland. We stop at three different places, first at the beginning of the lagoon. Here we make a short hike along the lagoon. Then we drive further towards the beach close to Jökulsárlón. There are a lot of icebergs on the beach, which makes it a beautiful place to make some photos. Our 3rd stop is at the visitor centre, here we can see some harbour seals. And some enormous icebergs drifting towards the ocean. Now we are heading to Höfn, to buy some groceries. From there, our plan is to go to the mountain Vestrahorn, but the mountain is completely disappeared in the fog. So we have some extra time to visit some other place. We heard from a friend that Lónsöræfi is worth a visit. The first part of the F980 goes very smoothly, but once we reach the river Skyndidalsá, we lose the track. So we decide to turn back to the ring road. We are still not sure where we want to stay this evening. We will decide it later this day. Now we are heading to Djúpivogur. After a while, we take a break along the mountain Eystrahorn. Close to this mountain, there is a lighthouse, it looks like a robot. 🙂 When we arrive in Djúpivogur it is still too early so we drive further towards Breiðdalsvík. It’s already dark when we arrive at the camping in Breiðdalsvík. Today we start quite early because we have to drive more than 400 kilometres. About 30 percent will be on F-roads, with a few river crossings. We don’t take the ring road but we take a detour via Stöðvarfjörður. Just before we reach Fáskrúðsfjörður, we follow the road 96 towards Egilsstaðir, to buy some food and to refuel our car. We arrive in Egilsstaðir around 10am. About a half hour later we are ready to drive towards Hengifoss. And 30 minutes later we are at the car park of the waterfalls. It’s already quite busy on the parking lot. But we are lucky to find a place to park our large jeep. The hike towards the waterfalls is about 6 km long and goes over a well-trodden path. First, we pass the waterfall Litlanesfoss, surrounded by vertical basalt columns. Then it’s about one kilometre till Hengifoss. Hengifoss is one of the highest waterfalls in Iceland, measuring 128 meters falling from the plateau into a magnificent gorge. There is a colourful rock face surrounding the waterfall showing different layers from volcanic eruptions in the Tertiary period when Iceland was formed. Now we walk back to the car. When we arrive at the parking lot, it’s overcrowded. We are happy that we did this hike earlier this morning. At this moment we couldn’t find any place to park our large jeep. We are happy when we are driving on the F910, we are almost alone. After a while, when the mountain Snæfell is on our left side, we take the F910 to the right, up north towards the bridge over the river Jökulsá Á Dal. Once we have passed this river, we keep following the F910 until we reach the crossing with the road F905. From that moment we follow the F905 towards the old ring road 901. There is a beautiful campsite along this road in, Möðrudalur with a cool gas station. Now it’s only a few minutes until we are back on the main ring road. Before we drive towards Dettifoss, we take a small detour towards Námaskarð. At the foothills of the Námafjall is an expanse of hot springs called Hveraröndor Hverir that is known for their changing variety. You may also find a number of fumaroles, mud pools and mud pots that all seem to be boiling with relentless energy. But after a few minutes, one of our travel buddies starts to feel sick of the sulphurous fumes. So we drive away from the fumes, close to ring road there is a fenced meadow with more than 500 sheep. They sound hilarious, beeeehhh, buuuuuuhhhh, buurrrbbb. There’s also a sheep that screams HEEELLLPPP. 😀 After a while, we are really irritated about the midges. So we drive further towards Dettifoss. We take the F862, we don’t know why they call it an F-road because it’s a tarmac road all the way to Dettifoss. We arrive just on time. The sun is going down. First, we walk towards Selfoss. Because there are almost no other people over here. It’s a horseshoe-shaped waterfall on the powerful glacier river Jökulsá á Fjöllum just upstream from the mighty Dettifoss. After a few minutes, we walk towards Dettifoss. The falls are 100 meters wide and have a drop of 44 meters. It’s the most powerful waterfall in Europe. It’s almost dark when we are back at the car. Now we are heading to Húsavik via the road F862. It’s almost dark when we are back at the car. Now we are heading to Húsavik via the road F862. The road is terrible, there are a lot of holes in the road surface. And it becomes worst when it’s completely dark, and we are still on the same road. Finally, an hour later we have reached the road 85, now we have to drive about 40 minutes till we are in Húsavik. It’s around 10:30pm when we are the campsite. Charlotte and Cindy are making our dinner meanwhile Oscar and I are setting up our tents. And we are so lucky just when we are done with our dinner, we see the northern lights again. Not so good as the first time, mainly because there is too much light in Húsavik. Now we are going to sleep. We are lucky today, the weather is just perfect to do a whale watching tour. We had already chosen to do the tour with a sailing boat. There is only one firm with sailing boats in Húsavík, that’s North Sailing. We take the ‘Whales and Sails’ tour with a traditional Icelandic schooner called ‘Haukur‘. Just before we go on board of the boat everyone gets a professional 66°North sailing outfit. Once we are on board the crew gives us a warm welcome. First, we have to sail for a while towards the mountains Víknafjöll. Once we are approaching the mountains we see the first whale spray. But it’s too far to see the whale itself. But ten minutes later there is a spray pretty close to us. Now we can see the whales, it’s a humpback. From then on we see a humpback every ten minutes. After a while, we go searching for a minke whale, closer to shore. But after a half hour, we give up and go back to the humpbacks. Suddenly our guide sees a glimpse of harbour porpoise. But they are really fast, and we couldn’t see it. On our way back to the humpbacks, we see a minke whale, most of the time you can only see them at the shoreline. Once we are back at the humpbacks, we got surprised. Suddenly there is a whale spray along our boat. Now we can almost touch the humpbacks. Once they go for a deep dive it’s a perfect moment to end a beautiful tour. On our way back to the harbour we get a cinnamon roll and a hot chocolate, and who wants can get a ‘captain privilege’. Once we are back in the harbour we walk back to our car. Now we are heading to Goðafoss. We take the same road 85 till we cross the main ring road again. Once we are on the main road we are almost at the waterfall. Once we arrive at the waterfall Goðafoss, we are a bit disappointed. Due to the wind, there is a lot of water spray coming in our direction. Normally it’s one of the most beautiful waterfalls in Iceland. The Icelandic name means ‘waterfall of the gods’. The water of the river Skjálfandafljót falls from a height of 12 meters over a width of 30 meters. Due to the heavy water spray, it’s difficult to make a picture. The lens of the camera is soaked wet in less than a second. We try it a few times but then we walk back to the car. Now we are heading towards Hveravellir. We follow the ring road towards the west. On our way, we pass the capital of the North Akureyri. A few minutes later we are driving through a beautiful valley Öxnadalur. Unfortunately, there is almost no place to stop along the road to take some photos. But luckily we find a place, with a beautiful view of the valley. We keep following the ring road until we leave it towards the F35 towards Hveravellir and Kerlingarfjöll. Once we’re on the F35, the weather changes from a sunny blue sky to a lot of fog, rain and a lot of wind. Once we arrive in Hveravellir, there is nothing to see. Only a thick fog and a strong wind. We decide to drive further towards Kerlingarfjöll. Hopefully, the wind is not so strong in the valley, where the camping is situated. When we arrive at the camping/cabins in Kerlingarfjöll. The weather isn’t so worse as in Hveravellir. But when we want to check in, we can choose to sleep in the dorm room for the same price as a camping place. But we choose for a private cabin with shower and toilet and breakfast included. We have slept well this night. When we have loaded the car, we have breakfast in the main cabin. The weather seems to be better than yesterday evening. There is a blue sky, but the wind is still very strong. After our breakfast, we decide to drive towards the small parking lot close to Hveradalir. On our way to the parking lot, the weather is changing. The wind is stronger than yesterday, and the visibility is poor. Once we are at there, we walk a few hundred meters. But the wind is too strong, and the terrain is very slippery. We decide to go back to the car, it’s just too dangerous at the moment. But we will definitely visit Kerlingarfjöll in the future. Now we are heading towards the Golden Circle, for a lot of tourists the highlight of their trip to Iceland. First, we need to follow the same road F347 back to the main road F35. Once we are back on the F35, we drive towards the famous waterfall Gullfoss. On our way we pass the glacier Langjökull, we take a detour along a nameless road to get a better view on the glacier tongues Suðurjökull and Norðurjökull. The view on the glacial lake Hvítárvatn is also beautiful. Once we are back on the F35, we have to drive for about an hour until we are at Gullfoss. Gullfoss is one of the most famous waterfalls of Iceland. It’s located on the Hvítá river which is fed by Iceland´s second biggest glacier, the Langjökull. The water plummets down 32 meters in two stages into a rugged canyon which walls reach up to 70 meters in height. It’s a beautiful waterfall but we visited a lot of waterfalls during this trip that is more beautiful than this one. This one is just too crowded. But that’s normal because Iceland is promoting the Golden Circle a lot! After about ten minutes we leave Gullfoss to drive towards Geysir. It’s about ten minutes with the car towards it. The Geysir itself is not erupting anymore. Today the nearby Strokkur bursts out every few minutes and sends up a column of water and steam with enormous force up to 35 meters. After the Strokkur erupted a few times we walk back to the car. Now we are driving towards þingvellir. About 45 minutes later we arrive at the parking lot of þingvellir. First, we walk along the church Þingvallakirkja. Alþingi, the Icelandic Parliament, was established at Þingvellir in 930 and remained there until 1798. Þingvellir National Park was founded in 1930, because of the 1,000th anniversary of the first Icelandic Parliament. It became a World Heritage Site in 2004. From there we walk towards the waterfall Öxarárfoss that is formed by the river Öxará at the Almannagjá. The river Öxará is going to the largest natural lake þingvallavatn in Iceland. From here we walk towards the biggest crack Almannagjá, that is created by the continental drift between the North American and Eurasian plates. On top of the crack, you got a beautiful view of the area. But at the moment the wind is blowing in the wrong direction so it’s not possible to make any good picture without raindrops on it. Now we are heading to Hraunfossar and Barnafoss via the road 52 and F550. We are hoping to have a nice view on the glaciers þórisjökull and Langjökull. But the weather is bad, a lot of rain and fog. The visibility is almost nothing, but this route is a lot shorter. After a while, we arrive at the waterfalls Hraunfossar and Barnafoss. First, we walk towards the waterfall Barnafoss. But it’s more a series of rapids on the Hvítá River. From there we walk to the waterfall Hraunfossar, it means lava waterfalls. It’s a series of waterfalls formed by rivulets streaming over a distance of about 900 metres out of the Hallmundarhraun, a lava field which flowed from an eruption of one of the volcanoes lying under the glacier Langjökull. Normally the water has a beautiful blue colour, but due to the heavy rainfalls of the last days. The water of the river is completely grey. Now we are heading towards Snæfellsnes peninsula. On our way to Snæfellsnes, we pass a larger city Borganes. We are hoping to find a camping near explosion crater Eldborg. But the camping is already closed. So we have to find another place to stay this evening. It’s already dark outside so we hope to find it quickly. Just when we pass the beach Ytri Tunga, we find a sign that there is a camping in the area. About 5 minutes later we arrive at the ‘camping’, it’s better to call it a grass field, there is a toilet with no light. We park the car in the direction of the wind so we can camp behind it as much as possible out of the strong wind. Today the weather is even worse than yesterday. But we will make the best of it. First, we drive towards the beach Ytri Tunga well known for its seals. A few minutes later Charlotte spots a harbour seal. There are a few seals in the area but this one is pretty close to us. From here we drive towards Rauðfeldsgjá gorge. The weather is terrible when we arrive at the Rauðfeldsgjá Gorge. But we definitely want to see the inside of the deep ravine, that cuts into the east side of the mountain Botnsfjall. It’s a short walk to the entrance of the gorge. We have to walk through a small river Sleggjubeina, to get inside the gorge. It’s a beautiful gorge with a hidden waterfall and green mossy walls. It’s not possible to take pictures because of the water damp. But we tried to film it with our GoPro. Moments later we arrive at the small fishing village Arnastapi at the foot of Mt.Stapafell. We take a walk along the coastline, there are some unique basalt formations. The most spectacular one is the cliff Gatklettur. Finally, we find an abandoned house close enough to the road. Most of the time it’s not possible to reach the houses. We find this small yellow sand beach on our photographer map. It’s quite small but the basalt formations are beautiful. And we are lucky the weather is pretty good at the moment. There is only a lot of wind. Our next stop is the famous mountain Kirkjufjell, probably one of the most photographed place in Iceland, for sure on Snæfellsnes Peninsula. But sad enough the weather is extreme. The wind is extremely strong and it rains heavily. So the long exposure filter is no option but we want to make a short video of the weather. We can barely see the mountain Kirkjufjell. But I can make one photo of the mountain. Because of the extreme weather we want to drive closer towards Reykjavik then we had planned to do. We hope that the wind will be less stronger than on Snæfelsnes. We stop a few times along the road before we arrive in Bjarteyjarsandur. It’s a farm where it’s also possible to camp. Harpa is a concert hall and conference centre in Reykjavík. Harpa was designed by the Danish firm Henning Larsen Architects in co-operation with Danish-Icelandic artist Olafur Eliasson. The structure consists of a steel framework clad with geometrically shaped glass panels of different colours. 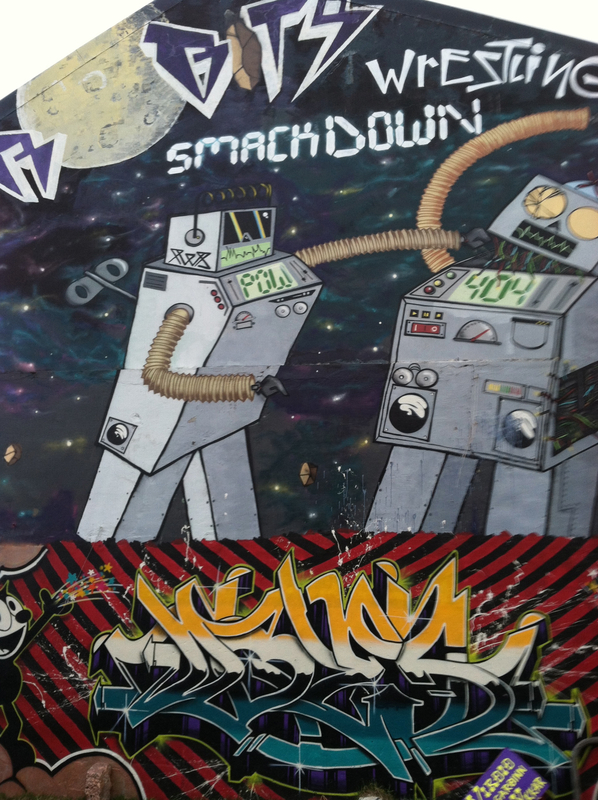 There are a lot of places where you can find street art. 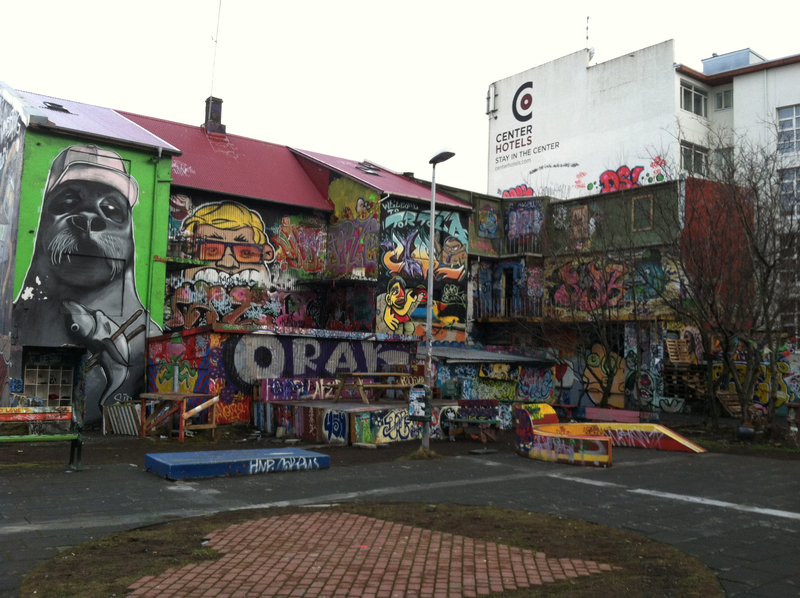 Unfortunately, they destroyed the coolest street art area in Reykjavik downtown, to build a new hotel/apartment complex. My favourites where the sushi eating seal, the glittering mountain and the wrestling robots. It’s a sculpture by Jón Gunnar Árnason. Sun Voyager is a dreamboat, an ode to the sun. Intrinsically, it contains within itself the promise of undiscovered territory, a dream of hope, progress and freedom. One of our favourite places to relax in Reykjavik is the record store 12 Tónar. It’s a small record shop and it’s also a record label for Icelandic bands. It is located on Skólavörðustígur 15, in downtown Reykjavík. Founded in 1998, 12 Tónar has been well received by music lovers from the start. The store quickly became a meeting point for musicians such as Björk, múm and Sigur Rós. One of our favourite bands. It’s the largest church in Iceland and one of the tallest buildings in Reykjavik. The church is designed to resemble the basalt lava flows of Iceland’s landscape. The church houses a large pipe organ, there are 102 ranks, 72 stops and 5275 pipes. It is 15 metres tall and weighs 25 tonnes. The church is also used as an observation tower. You can take a lift up to the viewing deck, the view from here is magnificent. Most of the time we bought our groceries in the Bónus stores. But also in the Kjarval and Nettó, we found the last one the best. But we only found them in a few cities. This map can be very useful for planning your trip. Most of the time we used the most common N1 fuel stations. Sometimes they got a small grocery store. Be careful when you drive to the highlands because there are not so much fuel stations in the highlands. The most beautiful one was near the hut Blágil close to Lakí. Pretty basic, there was a toilet and a sink. But no option to take a shower. But the view from the campsite is outstanding! The campsite near the farm Bjarteyjarsandur was also excellent. The view was not so special. But you got free showers and it’s possible to use a well-equipped kitchen. The campsite in Landmannalaugar is also beautiful. But it’s expensive and you have to pay a lot if you want to take a shower. So it’s better to take a bath in the natural hot springs. Hornið, a delicious Italian restaurant. This time, we booked an apartment with Airbnb, normally we stay in a hotel of a guesthouse. But now we were with four persons and it was just cheaper and better to book an apartment. We stayed in Karen’s apartment, it was perfect. Clean, big enough for four persons and close to downtown Reykjavik. We can also recommend AR guesthouse, we stayed there during our trip in 2012. It’s simple and clean, and pretty close to the BSÍ bus terminal in Reykjavik. It was our second time that we booked a room at Guesthouse Alex. It’s located close to the airport. The rooms are simple but very clean. And Guesthouse Alex provides a free airport shuttle.